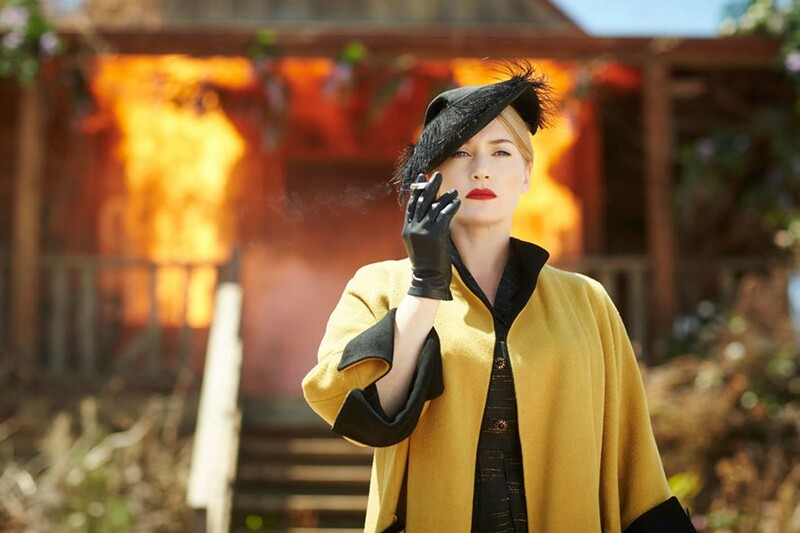 Kate Winslet burning up the countryside in "The Dressmaker." "I'm back, you bastards." These are the first words we hear from Myrtle "Tilly" Dunnage (Kate Winslet), who's returned to her hometown in 1950's rural Australia, much to the chagrin of the petty, gossiping townsfolk who decades earlier ran her out of town on a rail for a crime she only barely remembers. Now a talented seamstress trained on the runways of Paris and Milan, Tilly has come home again to get some closure, reconcile with her bitter, alcoholic mother, Molly (Judy Davis), and perhaps -- if the opportunity presents itself -- enact some revenge on those who wronged her in the past. In little time, she has set up a modest dressmaking business out of her mother's home, her sewing machine working overtime as she drapes the women of the town in the most fashionable haute couture. Along the way, Tilly even manages to pick up a love interest in the form of a sweet farm boy named Teddy (and what a form it is: Liam Hemsworth clearly has no qualms about playing the beefcake role). One-by-one, Tilly transforms the women into glamorous visions straight out of the pages of Vogue, but it slowly becomes clear that their elegant new appearances do little to hide their inner ugliness. As Tilly, Winslet is predictably wonderful in a star turn that lets her have the most fun she's had on screen in quite some time. Vampy, glamorous, and a bit dangerous, Winslet lets us see the very real pain that fuels her every action. There's one tossed off line she says to Molly about knowing what it's like to have lost a child, that I wished the script (by Moorhouse and her husband, P.J. Hogan, based on a novel by Rosalie Ham) had taken a moment to explore -- but this is a complicated, fiery role that Winslet clearly relishes. While none of his earlier roles have managed to endear the younger Hemsworth to me, this is the first time he's shown signs of the natural charisma that's made his thunder god brother a star. Davis is fantastic in a scenery-chewing performance that's more challenging than it appears at first glance -- Molly is mean-spirited and difficult, but the veteran actress skillfully allows us to understand and, eventually, even like her. Hugo Weaving gives some excellent support as the town's cross-dressing lawmen who provides Tilly one of the few remotely sympathetic faces (perhaps because he understands something about hidden shame and fear). "The Dressmaker" is a fascinating mix of tones, shifting between dark humor, melodrama, and a bit of camp -- with just the right amount of crazy to give the film its pleasantly nutty flavor. Moorhouse's film is phenomenally entertaining, even as it goes to places a good deal darker than the typical period drama audiences may be expecting. Every time you think you have the film pegged or know where it's heading next, it throws in a delicious new curve.